Since Shiva and I are on vacation all week, we have asked several of our fellow bloggers to fill in while we enjoy long naps on the sofa. After a crazy agility workshop on Sunday afternoon, we are feeling just that lazy. Today’s guest post is brought to you by the always-entertaining writer of Dog is God in Reverse. Human to four very different dogs, she offers a unique perspective on life and remaining sane. Quite frankly, I don’t know how she has survived all this time. I’d like to thank Kari for taking the time out of her insanely busy life to help us out! We recently added a fourth, yes fourth, dog to our family. Having been a life-long Scooby Doo lover I just couldn’t say no when a friend told me about an 8 year old Great Dane at animal control. Breed rescue had been called but they said “No, she’s too old.” Her time was up, she had already been there for two weeks which is longer than most get. After some time spent convincing the husband (I travel for work every week so the dogs are mostly his responsibility) we made the decision. I was immediately in a state of shock. Could I really do this? What if she dies right away? What if she is sick (even though the animal control exam found nothing) and it is something incurable? I didn’t have these fears with our other three dogs. Baily came to us as a pup from rescue, Mesa was 9 months old from animal control and Big Carl was 2 from rescue. 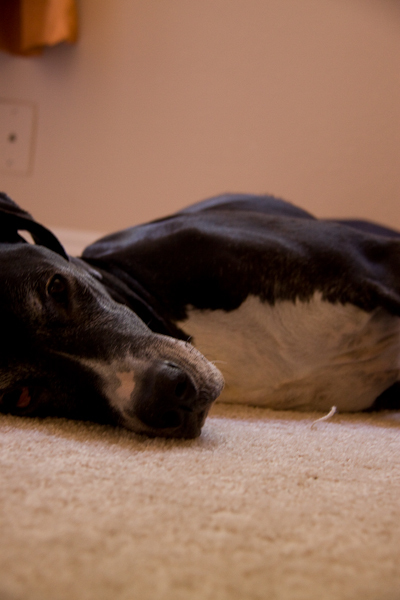 The biggest question that lurked for me was “Can I let myself love her as much as I do the others, knowing that we have so little time together?” It sounds selfish but the life expectancy of a Great Dane is 7-10 years, and she was already 8. I told many people how I was setting myself up for heartbreak. When I returned home on Thursday night from work, I was greeted by Tori and instantly fell head over heels in love. I took her to my vet and was given a clean bill of health. Over the past couple weeks she has really come out of her shell and I fall more in love each day. I know it won’t be easy and that the end will come too soon, but I have decided to open my heart and embrace what time I have with this goofy, attention loving pup. Tori is so beautiful! She is so lucky to have found you and is loved. I love Great Danes (and my Youngest loves Scooby Doo!). Whatever time you have will be well worth it. It doesn’t take long to fall in love, does it? I adopted my previous dog, Shadow, at 8 years old thinking we’d have plenty of time together. She was diagnosed with osteosarcoma in her jaw shortly after we adopted her and we were told she’d only be with us a few months. Knowing her prognosis made me determined to give her as much fun as possible. And, since she surprised everyone by living 2 years instead of 2 months, that was a lot of fun. We are a huge fan of Kari’s blog…maybe its cause we have the same name?! haha. She is an amazing person with dogs – she has a huge heart and it was no shock to me when she rescued Tori. If anyone can give this dog the last few years of a great home and love its Kari and Ian. Tori is one lucky gal cause she has landed in dog heaven. bravo! i think this is just fantastic. my husband and i really want to adopt senior dogs, more or less from now on. we just feel like their chances of getting to be happy for the rest of their lives are so slim. at this point, we still have just desmond, but when we do get another dog, i think 5 years old is the youngest we’ll go. Such a great story! It can definitely be scary adopting senior dogs because it’s so hard to lose a pet, let alone one you feel you never really got a chance to know. BUT to me those dogs, who are often dumped at pounds by previously loving families “because he’s too old” are the dogs who need the chance to be surrounded by love in the end. I also think people can be surprised just how long dogs can live… it’s a risk because you don’t necessarily know but that 12 year old border collie could give a family another 4 or 5 years of love… not super long, but definitely long to leave a forever footprint in the lives of the people! She’s beautiful and you have such a great heart to open it to an older dog. You gave her a soft bed for the remaining part of her life… and that’s the most beautiful thing anyone can do for a furry. Many people won’t. You will be so blessed. Congrats on the new family member! Even young dogs leave us way too early sometimes. We can’t control when they will go but we can treasure every moment we have with them. She is gorgeous and I know she will enrich your life for the rest of hers. I also chose to adopt an older Dane who was a rescue. I adopted him at 6 years and he is now 7. I was worried that nobody else would chose him because of his age, so I stepped up. He came to our family so well behaved, easy, and is a complete joy. I also have a one year old Dane I got as a puppy. She is the one who has all of the problems….craniomandibular osteopathy, Addison’s Disease, her third eyelids are so overgrown it looks like bad cherry eye in each eye she has to have surgery, potty training issues, etc. So really an older dog can be better because you know what you are getting! :). I help out 2 rescues and I am grateful that you choose an older dog. Any time you can give them in a loving home is truly a gift. Tori is adorable! Congratulations on the new addition! I’m so happy to hear Tori has been given such a good and loving home. How awesome of you to rescue this girl!! The truth is, you never know how long you’ll get, even if you adopt them young. We adopted a five year old Dobe, and he passed almost exactly one year after we adopted him – and you know what, even if I knew that was what would happen, I still would have taken him and loved him just as much. Thanks again for giving this wonderful old girl a second chance!! It’s wonderful that you adopted Tori despite her age! We adopted three rescues this year, including one who’s about 8, and it turns out it’s our youngest one (1.5 years) who’s causing us the most concern healthwise. You really just never know–age doesn’t always matter! I hope you and Tori enjoy years together! Way to go! It’s so painful to say good-bye, but they make us so happy while they are here. I so admire people who commit to giving a good home to an older dog. They are so deserving of love and a peaceful place to live out their years. You may not have many years, but what time you have will be wonderful as your bond with Tori grows. That is a great picture! I’m glad that you brought her home…we never know how much time we have. THANK YOU for adopting an older dog no matter how long she has left. Tori is already enriching your lives, as you say. I once adopted a 15 y/o GSD mix guarded the deceased body of his owner :(. He lived to 17, defended a Beagle from a neighbor dog (well, went to the defense but ended up not needing to do anything, thank you, God) and I miss him. You will miss Tori and then, I pray you adopt another senior dog ! I love them, my sanctuary is full of them, they have no more problems, really, than any other age of dog; just perhaps a shorter life span. Not enough people adopt them, though, for many of the reasons stated but people forget the LOVE they bring with them – they have a lifetime of practicing LOVE. Tori is gorgeous! No matter how long our pets live with us, it always breaks our hearts when they must leave us. We wish more people would adopt senior pets. Our adopted cat Zeek was almost 8 yrs old, had been in foster care over 2 years. No one wanted him due to his age. But Mama saw his picture and that was it! She had to get him. I agree with your other commenters and what a nice post as well. I’m sure you’ll have made plenty of great memories by the time she leaves you, especially since each new day is one she wouldn’t have had without you! You never know where life will take you! We adopted a seven and a half year old dog thinking we’d give her a few good years as a pet before she passed away. Nine years later, we are crushed that she’s gone, but also so very happy that we took the journey. I’ve learned valuable lessons from each of our dogs, and Lilac was no different. She didn’t roll over for old age, she ignored it when she wanted to and used it to its full advantage when it suited her needs! I’m a better person all around for having known her. I have a heart for older dogs, but still feel afraid to adopt one, so afraid my heart will be broken. I am trying to get over this feeling by knowing I would be doing something wonderful for a homeless older dog. But still I wonder if I’ll be able to do it. Your new friend sounds like a special pal. I’m sure you and Tori will make the most of the time she has with you, and hopefully she will surprise you with how long it is. Well done on taking in and falling in love with an older girl. She looks like such a honey. Tori is just gorgeous and I am so glad she is blending well with the rest of the pack. Adopting a senior dog is SUCH a gratifying experience. I’m looking forward to the day Stumpy and I can bring an older dog into our home.